Food prep Sunday | gingerbread smiles. Yesterday, after writing my meal plan for the week, I decided to pop to Aldi and pick up the food we would need. There were a few things that would involve me spending a little extra time on them before they would be ready for the upcoming week. With my Sunday afternoon I got stuck into the kitchen and started preparing some grub. First up was granola. 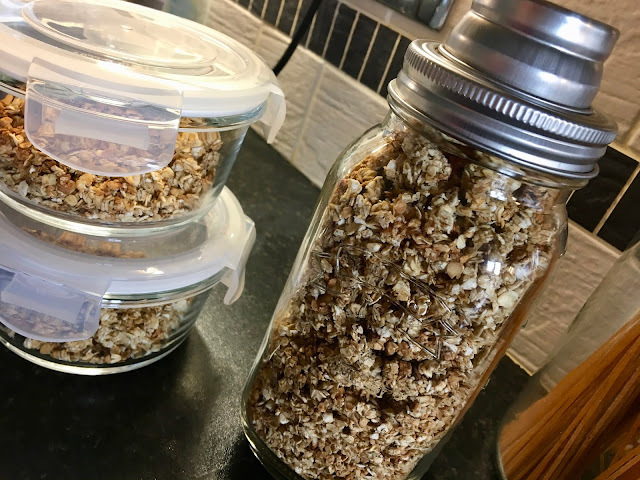 I've made this simple granola twice now and it has been delicious. Just as good as store-bought but with the simplicity of just being oats. This recipe is from Southern in Law and is super cheap, quick and easy to make! Next up was a new recipe that I'd not tried before. I always struggle to have a healthy, nutritious breakfast and recently I've been wanting to get more protein in my diet. Whilst browsing Pinterest I came across this Strawberry Cheesecake Chia Seed Pudding. From The Foodie and The Fix, this recipe involves putting everything in a blender (except the chia seeds, oops) and then putting it in a jar to set overnight. Doesn't seem too difficult does it! I put this into My Fitness Pal and with the cheeky extra of cottage cheese (which you can't taste) each serving has 18g protein! It does have quite a bit of sugar due to the strawberries and sweetener (I chose honey) but its all natural... Tried this for my breakfast today and it is lovely! Whilst cooking up all my treats I also put together a big tub of fruit salad. We tend to buy lots of fruit but never manage to eat it all. To combat this, I cut it all up into a tub and stick it in a fridge. I find if it's already prepared for you, you tend to eat it. Now on to a little bit of savoury. 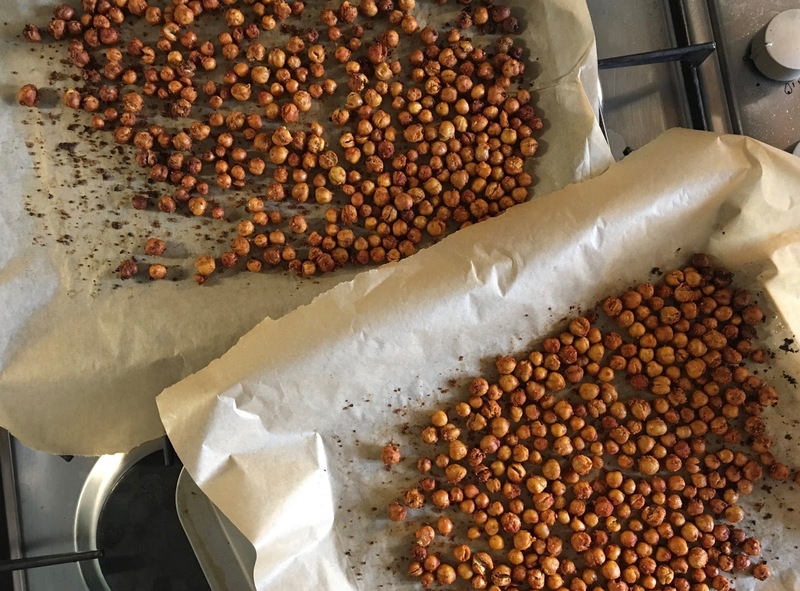 I've made roasted chickpeas before but hadn't thought much of them. Recently I was watching Healthnut Nutrition on Youtube and she was preping some chickpeas which she really seemed to love... We have many abandoned tins of chickpeas in the cupboard so I thought it was about time to let them see the light of day. Using Healthnut Nutrition's recipe I whipped up these tasty crunchy chickpeas to snack on. The key to these is definitely leaving them in for quite a while to ensure they get the crunch. I put garlic powder, paprika and cayenne pepper on mine, kind of like flamin' hot flavour monster munch. So that was my afternoon of food prepping, what do you like to make for the week on a Sunday? those chick peas look yummy! I need to try chia seed pudding recipe!